economic changes, and notes the unintentional humour along the way. The result is a perfect keepsake - amusing, yet informative, bedside reading for anyone with Cumbrian connections. Advertisements are everywhere. Often we barely notice them. Sometimes, when there’s something we specially want, we look at them carefully. What we don’t do is look at what they say about us. 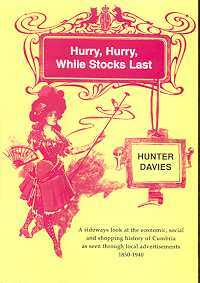 In his latest book Hunter Davies has taken a leisurely tour through all the adverts that appeared in Cumbria between 1850 and 1940. There were thousands and thousands all competing for the public’s attention. And the advertisers of yesteryear were just as resourceful and bold in their claims as any of today’s international agencies. Todd’s, who ran a fashionable drapery establishment in Wilson Street, Workington, were claiming that what Regent Street was to London, Wilson Street was to West Cumberland. Walter Willson’s branch in Aspatria boasted that they had shops everywhere. Atkinson and Griffin in Kendal had absolutely everything connected with sport. It was a fierce competitive world out there. Claims and counter claims were hurled about. Hotels advised that their patrons included the Prince of Wales. Central heating companies claimed that Sir James Graham had employed their services. But whatever it was that they supplied the business was always the finest, the best patronised and the cheapest. Some of the firms are still with us. Carrs used to place wonderful adverts showing their huge factory in Caldewgate. Thurnams were keen to promote their pianos. Bulloughs were going strong. Binn’s predecessor, Robinson’s, was advertising Twilfit Corsetry. Old traditional firms like Arnison’s in Penrith and Banks’s in Cockermouth were stocking an incredible range of products. Even Trinity School was promoting itself. It was the Carlisle Grammar School then and it prided itself on being an Ancient Public School with Excellent Modern Equipment. Other businesses have, of course, disappeared. Her Majesty’s Theatre in Lowther Street always offered a lively programme of entertainment. Another entertainer was Chas. Dargan, a moustachioed piano teacher from Lorne Street, and composer of the immensely popular song, “O, Bonnie Wetheral Woods”. A particular loss is the magnificent building of the Aspatria Agricultural College. It prepared young men and women for farming in the colonies. Behind the adverts there lies a social history of the times. West Cumbrian firms in particular, were offering passages for emigrants in the hard years of the 1930’s. In the 1890’s adverts needed to explain the advantages of the telephone. Forty years earlier, one of the biggest tourist attractions was Flintoff’s celebrated model of the English Lake District. Fashions changed in everything from clothes to embalming. The world of advertising was always alive, as it had to be, to everything that was new, to all the interests and enthusiasms of the time. Perhaps, more than anything else, adverts are a mirror of their times, reflecting the lives our grandparents and great grandparents really lived. Hunter Davies is the perfect guide. He is always ready to see the humour in the changing world but he also registers the immense social changes that were taking place. - Steve Matthews, Bookcase.